Can Am Spyder F3 turbo concept is a NASCAR-inspired beast! Can Am Spyder F3 turbo concept is 150 hp three-wheeler that you’ll want to try out. Without turbochargers these days you won’t get much performance. At least, that’s what performance is all about nowadays. The Can Am Spyder F3 we’re checking out today is here just to show you that you don’t have drive something on 4 wheels for the force induction to do miracles. It works its magic just as well on 3 wheels and even two for that matter. 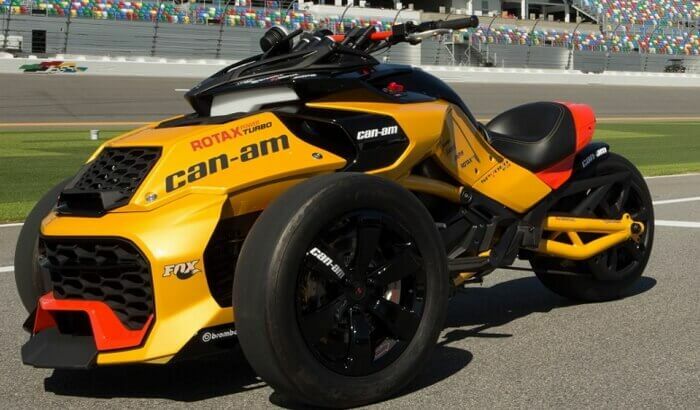 Inspired by the Speedway’s racing heritage, BRP introduced its first-ever turbocharged Can-Am Spyder concept vehicle as a tribute to NASCAR.The turbocharged Can-Am Spyder concept vehicle was unveiled at Daytona International Speedway. The Can Am Spyder F3 packs a 1,330cc three-cylinder Rotax engine. That beast produces 137 pound-feet of torque and 150 horsepower. Given the fact that it’s the turbo concept we’re talking about, the upgrades are real folks. The stock machine was able to put out 115 horsepower and 96 lb-ft of torque. The filled gap is not a huge one but, it still makes a difference. Moreover, the Can Am Spyder F3 with its added boost gets from 0 to 60 in 4.3 seconds. When it comes to the quarter mile, it gets across in 12.3 seconds, as Can-Am claims. Because there is extra power added to the Can Am Spyder F3 turbo concept, it gets a 3 into 3 Akrapovic exhaust. The sound part is important, too! In addition to that, there are Fox shocks to sharpen the handling part. Also, there are those slick tires to keep things planted. When it comes to the look of the Can Am Spyder F3, it’s pretty obvious that this thing doesn’t blend in easily. That’s mostly due to the bright yellow paint and the aggressive styling. Above the grille there are Led lights and a second intake – just in case. Oh and let’s not forget the SPORT mode that allows for controlled rear tire drifts. Unfortunately, the video below doesn’t offer a great opportunity to enjoy the turbocharger engine roaring around the place. Still, the Can Am Spyder F3 looks pretty cool. Of course, it got its performance to keep the riders satisfied. The other not-so-great news is that Can-Am doesn’t actually have plans to put the Can Am Spyder F3 into production. 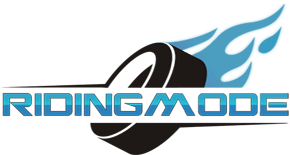 Instead, the company is using it as a way to promote BRP’s/Can-Am’s newly founded relationship with NASCAR, and the forthcoming Can-Am Duel At Daytona. The worst truck loading on a trailer ever! He ruined a perfectly good Pick up! Razor crazy cart – Poor kid crashes like a champion! TRC Supra battles Nitrous Hayabusa’s! This Pro Modified Ford Mustang by Moits Racing can go 5.59 @274mph at the 1/4 mile strip!!! Check This extremely bagged Hotshoe Customs 360 Motorcycle! Do You Want One?